A 30 year old man presents with acute painful swelling of the right parotid for 1 day. 1. What 3 questions you would ask in history? 2. What examination would you conduct? 3. What will be your management plan? ( Question from MCPS paper October 19th 2016). 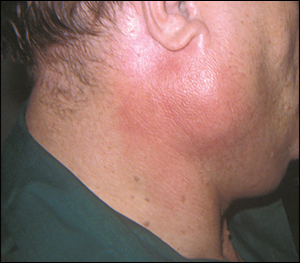 Acute swelling of the parotid . h/o fever and malaise, pain and difficulty swallowing & chewing, any dental infection? h/o mumps infection in past and either immunized for mumps? Look for redness, any discharging fistula. Palpate the swelling and look for signs of tenderness. 2. Check the cervical lymph nodes for enlargement and tenderness. 3, Look inside the mouth and examine for any dental infection, and also examine the opening of the parotid duct opposite the 2nd molar tooth. 4. Check for any ear infection. 5. Check the cranial nerve 7 . 6. Look for any associated swelling of the testes. symptomatic with analgesics and antipyretics to control fever and pain. Topical application of cold or warm packs on the swollen parotid may provide relief from pain and inflammation. Advice soft diet for initial few days until the swelling resolves. If associated orchitis , provide bed rest with scrotal support.